Meadow Lodge provides short or long term care services for people over the age of 65 and specialises in supporting those with dementia. Located in the pleasant village of Kellington, North Yorkshire, Meadow Lodge is a friendly, homely Residential Care Home set in spacious landscaped gardens. At Meadow Lodge we are committed to enabling our residents to live the life they want, providing them with the support, care and encouragement that they need. We assist our residents in living as full and independent a lifestyle as possible, ensuring they are consulted about matters that effect their wellbeing and quality of life. At Meadow Lodge you can relax in the knowledge that this is your home for as long as you want. Our residents are rarely admitted to hospital, other than for acute problems, generally we provide end of life care. To find out more about Meadow Lodge contact us on 01977 662 899 or email lorraine@meadowlodgehcs.co.uk. Visitors are always welcome, appointments aren't needed. We love to show visitors the day to day running of the home. 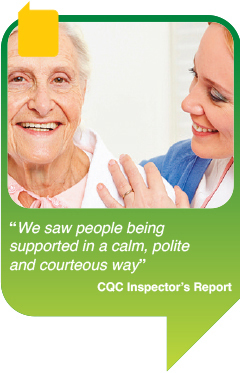 Meadow Lodge is regularly inspected by the CQC the national body which aims to make sure that care homes provide people with safe, effective, compassionate and high-quality care. They do this by inspecting services and publishing the results on their website.